Missed the Kimbers? Do not miss our store! Update 6/23/2013: CMP STILL has "rusty" Kimbers in stock, at only $425. This is easily the best deal on a 22LR rifle. Here is the link. The Civilian Marksmanship Program, a quasi-government organization set up to promote firearms training among the US population is selling surplus military rifles. The rimfire rifle of the day is Kimber 82G. 20000 of these were made in the late 80s for the Army's marksmanship training. The ones on sale by CMP are unused. I've been eyeing these rifles for a long, long time. Target rimfire rifles (in fact, target rifles of any kind) is a scarce - and dwindling - commodity. In fact, I don't think anyone in the US makes target rimfire rifles any more - if you want a new one, it has to be Anschutz, they are expensive and they are sold through relatively vague channels - you definitely cannot just play with one at a store. At least not at a store anywhere near Seattle. Unfortunately, the requirements to buy rifles from CMP are quite onerous as well - you have to have a "demonstrated" interest in shooting (C&R license works for this). You have to be a member of the right club (http://clubs.odcmp.com/cgi-bin/clubSearch.cgi). You have to have a proof of US citizenship. You have to send an application for the purchase, signed and notarized (http://www.thecmp.org/orderinginfo.htm), by snail-mail. So a couple of months back I have finally collected all the necessary documentation, joined the right club, and sent in the paperwork for three "rusty" Kimbers. The consensus on the Internet was that the "rusty" version is the way to go - the actual amount of rust is minor and in any case if shows (if at all) in the places where it does not matter. So I figured I'd take the risk and get 3 for the price of 2 regular ones. It takes 45-90 days, according to the CMP website, to get the rifle, and so it was in my case. They ship them back FedEx next day, morning delivery, and email the day before, so I waited for them to show up at home. The very first thing that I did that same morning was to check them for rust. The rust definitely was there. 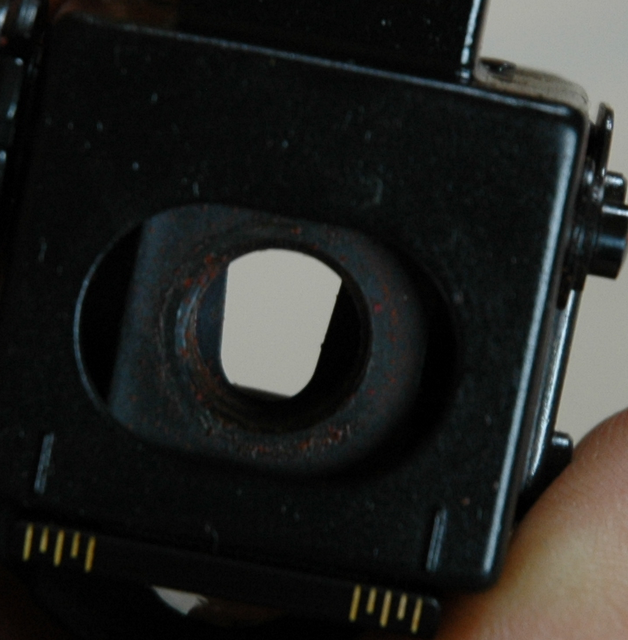 The rifle came with match aperture sights, and that's where a lot of visible rust was concentrated. Not one of the three sets of the sights was rust free. The rusting was light - just tiny dots of bright red. The photos overemphasize it, somehow, it looks much better in real life. How the rust got there, given the fact that the sights were in a sealed plastic bag, is completely beyond me. All three bores had a few imperfections, mostly close to the chamber, but in one of the three rifles it was roughly 1/3rd barrel length from the muzzle. I do not have a boroscope, so I could not tell if these were rust spots or tool marks, but the patches came out with not even a minor tinge of red, so I assume that they were the tool marks. Other than these impefections, the bores were mirror-bright. The were much smaller specs of rust on the trigger assembly and the receiver. All of them came off easily after being rubbed by a patch soaked with Break-Free CLP, or drowned in the CLP bath. 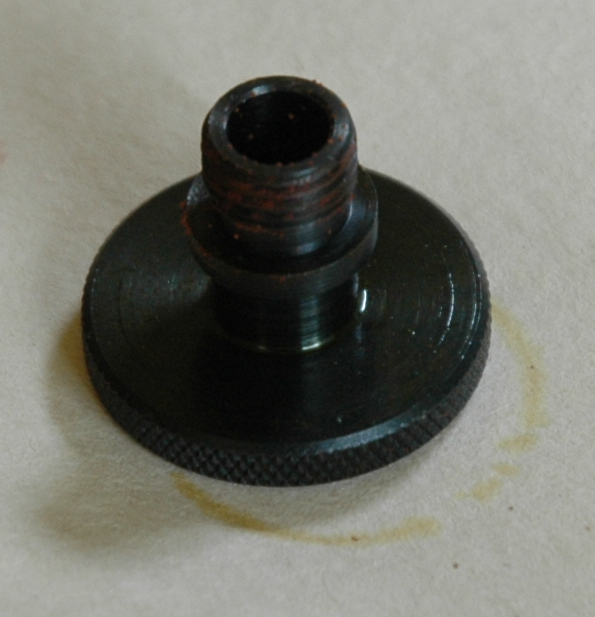 There were a number of posts on the Internet forums about rust inside the bolt, so I took apart mine. 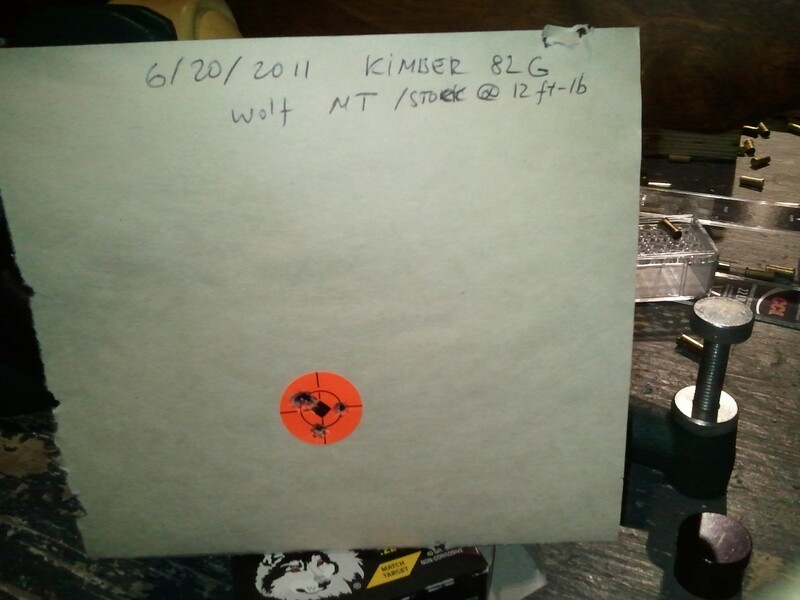 (The instructions on how to do it are here: Kimber 82G Bolt Cleaning.pdf). Two of the bolts had very minor amount of rust specs on the outside. One had significant amount inside - to the point that rust has caked the gaps between the strands of the spring. It was not deep, though, and all came off after an overnight soaking in CLP and going-over with a patch. The final imperfection was a shallow cut in the stock made when the rifles were opened for inventory in the mid-90s. The pictures below show the damage, which was approximately the same on all three rifles. Other than that, the rifle looked perfect - blue, wood, everything was new. On to the range. This is the result of shooting CCI Green Tag, American Eagle, and Wolf Match Target today. Conditions - light rain, calm. Shooting was at 50 yards, the orange dots are 1" in diameter. 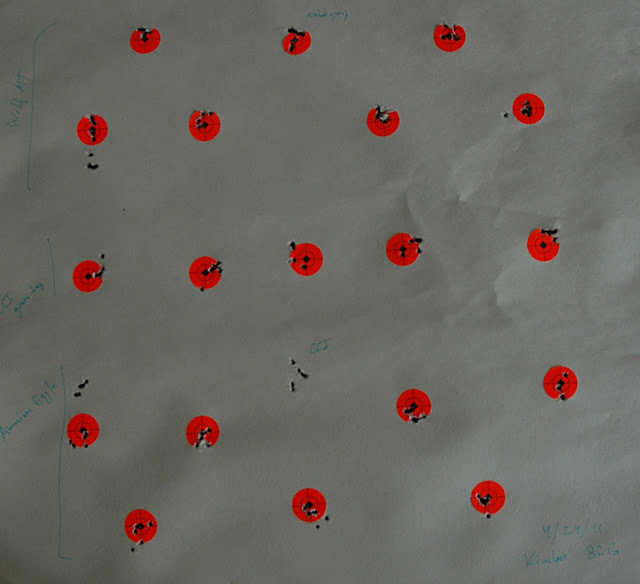 (*) The top middle group shooting Wolf was 10 shots and was excluded from the sample. The other groups were 5 shot groups. The 10-shot group measured 0.624". While these results might look passable for a 10/22, for a proper target rifle they are thoroughly unimpressive. Besides, I was really interested in shooting at a 100 yards, not 50. The secret about shooting 22LR at 100 yards is that whatever the muzzle velocity is, the ammo goes subsonic before it hits. So the accuracy is impaired because the sound wave catches up and perturbs the bullet flight. Also, because it flies slowly and the bullet is light, it is very sensitive to wind. As a result, if your average group is 0.5 at 50, the 100 yard group will not be 1.0 - it will be 1.5, maybe even 2.0. Because of all these handicaps, shooting rimfire at 100 yards is considered to be a good, cheap way to simulate shooting regular rifle and 600-1000 yards. Of course when I took it out to a a hundred yards, the results were... simply atrocious. 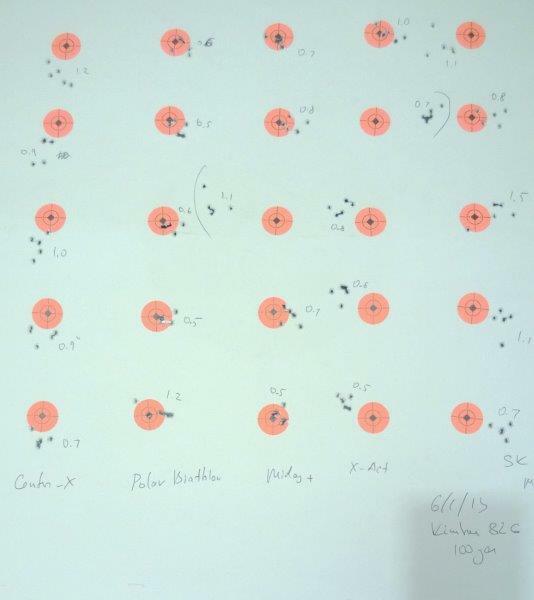 I do not remember what the groups were, and I did not keep the target because it was so bad, but I think the results were roughly equivalent to my CZ452. And this rifle is not supposed to be in the same class as CZ452. 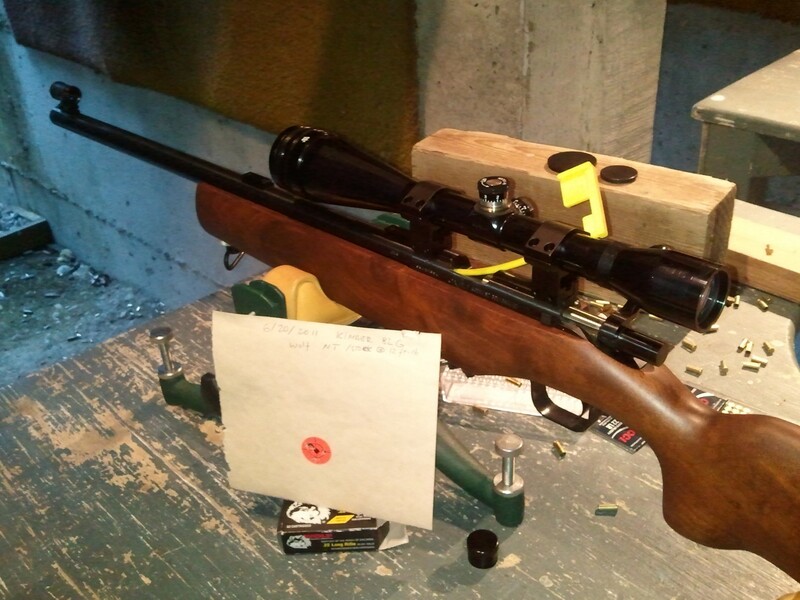 CZ452 is a very accurate rifle, but it's a sporter, not a competition target rifle. Kimber 82G, on the other hand, is. (*)There was one outlier group at 2.27". The first number includes this group, the second one excludes it. Since Precise Shooter have become a Lapua distributor, I am literally swimming in Lapua ammunition and components. So even though with all the new rifles to research I rarely come back to the old Kimber - which although it shoots exceptionally well, I consider to be also well understood - I figured I have to shoot it again with Lapua 22, since it is one of the best lineups of competition rimfire ammunition. ..and the statistics are here. On average, we have to agree that Kimber really liked Lapua! Interestingly, Polar Biathlon did the best, and has beaten the Federal Ultramatch from the earlier experiment - by a hairline, as it happens, because of a flier in the last group. Polar Biathlon has not historically shot well in any other of my rifles, I like that it works for Kimber because I have quite a few blocks of it on hand. Also interestingly, there was not a statistically significant difference between Midas+ ($18/box) and X-Act ($30/box), which I guess is a good news to budget shooters everywhere!